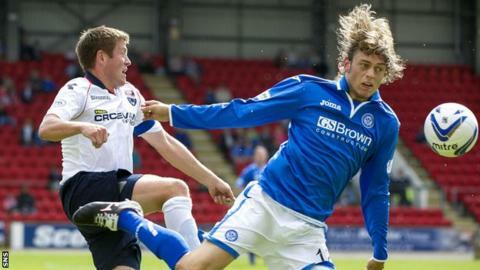 Murray Davidson has extended his contract at St Johnstone as he continues his recovery from a torn patella tendon. The 26-year-old sustained the injury in January and had been due to be out of contract in the summer. However, he signed a short-term deal in May and is now tied to Saints until the end of the season, with the possibility of an additional year. "We know what he is capable of," boss Tommy Wright told the club website. "He has worked extremely hard and is getting closer to full fitness and when he achieves that it will be like having a new player." Davidson, who moved to Perth from first club Livingston in 2009, has played two youth league matches and Saints say he has had "no ill effects". However, the club added: "He still has some way to go before full match sharpness is achieved. The one-year deal also includes an appearance-based one-year extension clause."